An early piano roll recorder, invented by William Thaule, Dresden, Germany, 1902. What marked out the beginnings of the reproducing piano, as opposed to the normal player piano, were the early attempts to record and play back the actual playing of pianists at the keyboard, by means of paper rolls which could be copied and to some degree mass produced. The very earliest piano recordings on paper strips were made as a means of transcribing musical ideas on to sheet music, thus allowing the ephemeral art of improvisation to be captured on the printed page. One can trace rudimentary mechanisms involving lead pencils or crayons back as far as the 18th century, and Dr Burney describes an instrument made by a German musician, Johann Hohlfeld, which he encountered on a visit to Berlin, which consisted of two cylinders, moving paper between them, on which, by means of a crayon, each key when pressed down by the player caused a mark to be made. The first attempt to develop a marking piano in any modern sense came in 1863, when an Englishman, Joseph Beverley Fenby, invented an Electro-Magnetic Phonograph, which used solenoids and inked wheels to mark up a moving roll. The use of inked wheels is particularly important, since this was the way in which Welte was subsequently said to have produced its original master rolls. Other marking machines followed, though still with the aim of converting improvisation into printed form. Then, in 1881, the French electrical and telegraph engineer, Jules Carpentier, demonstrated his Mélographe Répétiteur at the Exposition Internationale de l'Électricité in Paris. 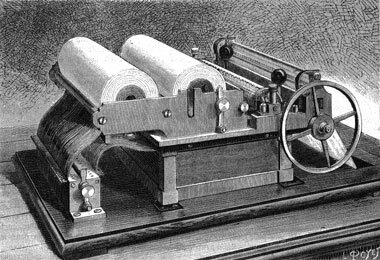 This highly ingenious device was effectively the first real-time perforating machine, though it actually shaved slots in moving paper by means of mechanical cutting wheels, rotating at high speed as the appropriate areas of the paper were pressed up against them by means of solenoids. The rolls produced in this way had a range of 50 notes, quite advanced in comparison to the contemporary American instruments. Carpentier's machines were placed in the category of Precision Instruments, and the inventor reported with justified pride that his construction team worked to tolerances of one hundredth of a millimetre, somewhat less than half a thousandth of an inch. Jules Carpentier's Mélographe Répétiteur, Paris, 1881. 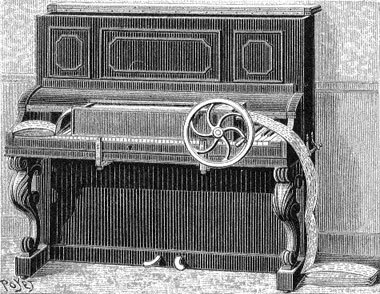 At this early stage, the corresponding playback mechanism, the Mélotrope, was permanently installed inside the same harmonium used for the recording process, but by 1887 Carpentier had modified both devices, restricting the range to three octaves, allowing for the Mélotrope to be attached to any style of keyboard instrument, and designing and constructing an automatic perforating machine for mass production. 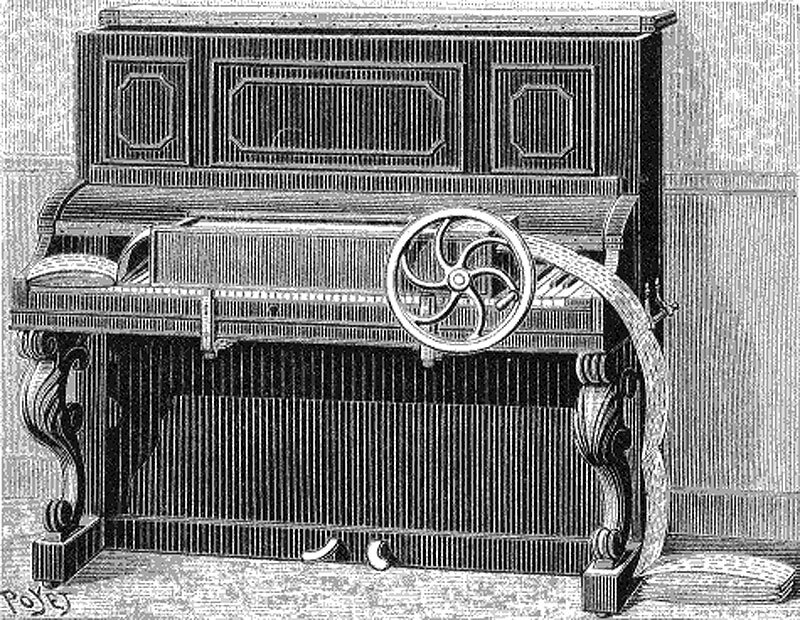 Carpentier's modified Mélotrope, Paris, 1887. It was mass production that shaped the international market for music rolls at this time, and 1887 also saw the foundation of the Aeolian Company in Meriden, Connecticut, as an effective merger of the Mechanical Orguinette Company of New York and the Automatic Music Paper Company of Boston. Without some automatic reproduction of dynamics, recorded music rolls for use with pianos tended to remain the preserve of enthusiasts at this early stage. 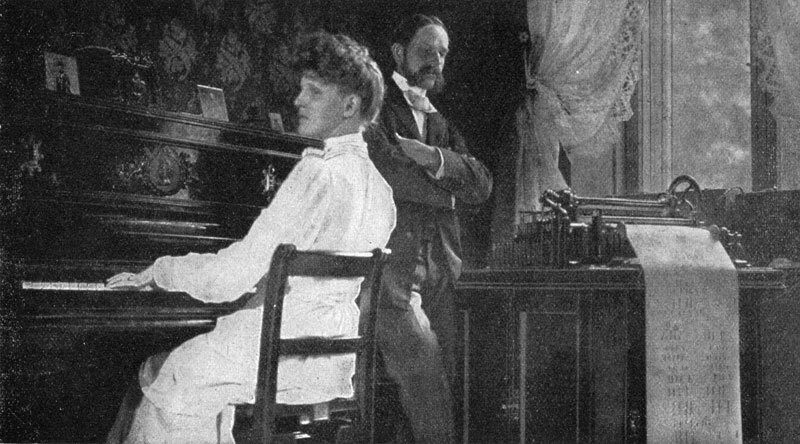 The system seen in the photograph at the top of this page was designed and built by William Thaule (1844-1918), a New York composer and pianist who lived in Oberlössnitz near Dresden around the turn of the twentieth century, and who can be seen supervising the recording process, as a young American pianist plays the adjacent upright piano. However, the picture poses rather more questions than it answers! Thaule's roll machine looks something like a perforator, indeed rather like the Pianola Institute's perforating machine in some respects, and another photo of the recording piano, reproduced below, clearly indicates an electrical recording and replay apparatus that could capture up to eighty notes of the keyboard, most likely bottom C to top G. That might make his photograph the first ever picture of a real-time perforating machine in use. 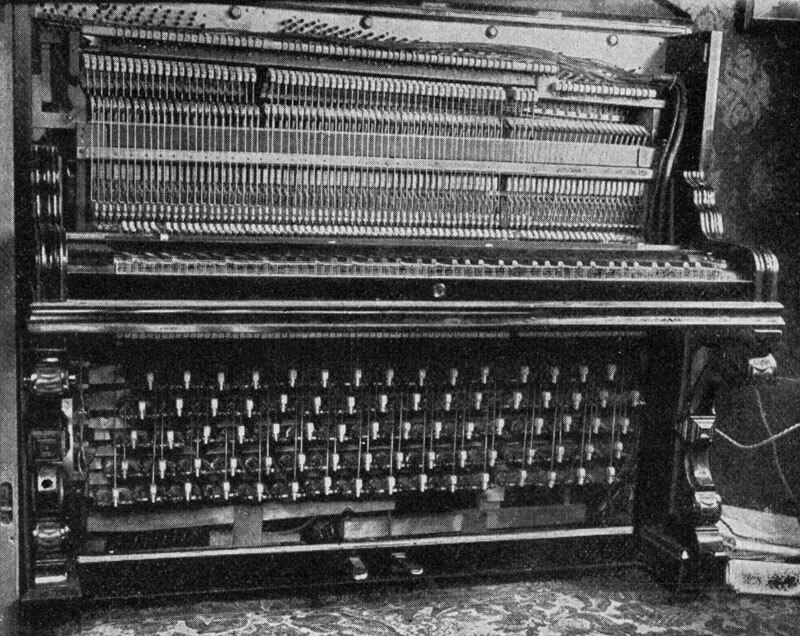 William Thaule's 80-note Recording and Replay Piano, Dresden, 1902. However, the piano roll on display has a range of roughly 65 notes, a recognised standard of the period, but not one that would have been produced by Mr Thaule's recording piano, unless he was deliberately not using certain areas of the piano that he had very carefully wired up and designed to record a full eighty notes, and that would be rather strange. It is also not entirely clear whether the displayed roll has really been perforated, or simply marked up in ink. 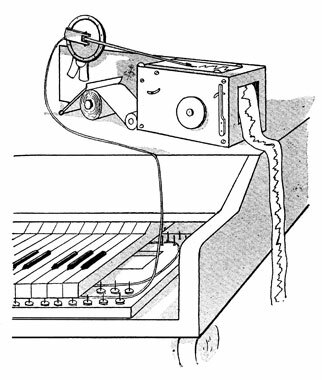 And where is the reading mechanism, to read the perforations or markings and send the signals to the piano, to operate the 79 or 80 solenoids clearly visible under the keyboard? 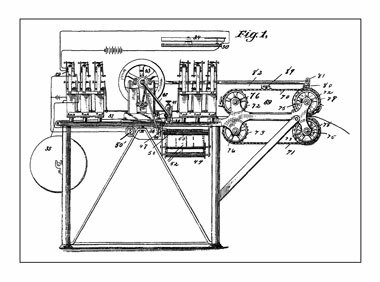 Perhaps the most likely explanation is that the roll production machine is restricted to 65 notes, which would have allowed the rolls to be played back on many player pianos of the period, rendering it more useful to the general musical public. All in all, it sounds like an invention that had not quite been completed. In any case, he was not the first: as early as 1894 there were real-time perforating machines in the USA which could instantly produce rolls from the playing of pianists. 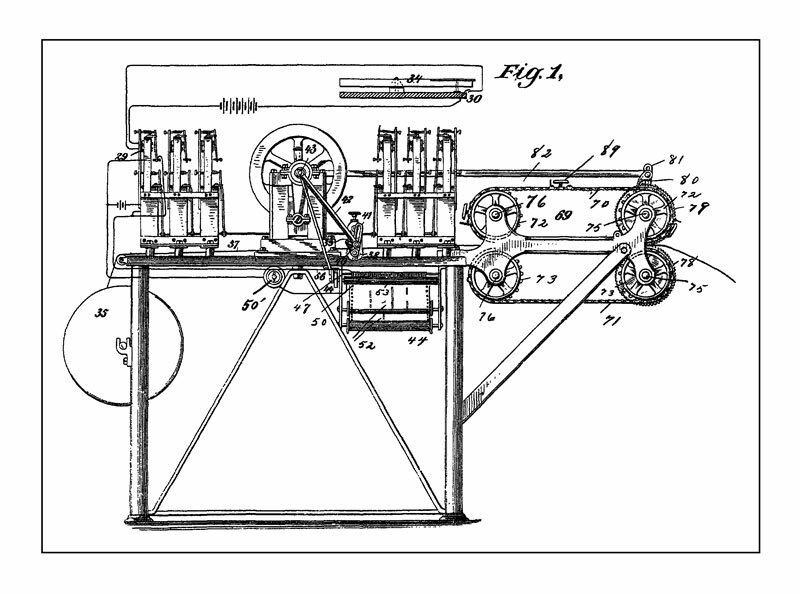 George Howlett Davis, an American engineer who worked for a while in the 1890s for the Automaton Piano Company of New York, patented at least two designs for perforating machines which could be operated from a piano keyboard. In a British patent for which he applied in 1900, he speaks of working to an accuracy of 2,200 perforations per minute, roughly 1/37th of a second. Given that player pianos can reproduce complicated music with many notes simultaneously, this is not so much worse than our present-day MIDI, which, if it is subjected to the twenty-note chords sometimes played by duettists, can only manage 1/50th of a second. It is on record that both Raoul Pugno and Emil Sauer recorded rolls on a perforating machine that Mr Davis had sold to the Aeolian Company, around the time of the Pianola's first non-commercial debut, in late 1897. Real-Time Perforating Machine, George Howlett Davis, New York, c.1900. But we should not jump to the conclusion that these machines were designed solely to reproduce the playing of greater or lesser pianists. Whatever the intentions of their inventors, they were initially used in order to speed up the process of manufacturing normal pianola rolls. The player-piano industry in 1900 was geared up to produce instruments which gave the owner the ability to play music as he or she desired, and the jump had not yet been made to a form of recording which allowed only passive participation on the part of the listener. As mentioned elsewhere on this website, rolls supposedly "played" by Scott Joplin, George Gershwin and many others can be clearly seen to be metronomic, meaning that every single beat has exactly the same number of perforation rows. Every case is different, of course: it is highly unlikely that Scott Joplin recorded most of his piano rolls, while Gershwin may have transferred his playing to stencil rolls by means of some factory piano and perforating machine, but the results would then have been used as the equivalent of written-out manuscript, to be turned into normal, non-recorded and thoroughly regularised rolls. The recording of Rhapsody in Blue is perhaps an exception, but once again, it is not clear how the jazz-band accompaniment found its way on to the issued rolls, and the most likely method would have been for a musical technician to have perforated it by hand on the master stencil. Stencil Recording Piano, Aeolian Company, London, England, 1911. 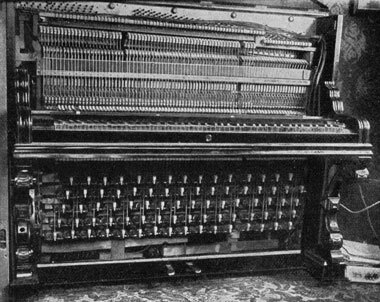 The Aeolian Company kept such an early recording piano in operation at its factory in Hayes, England, as late as 1911, when the above photograph was taken, though it seems clear, from the mechanical nature of the design, that it would have been hard-pressed to operate in real time. The paper on the perforating machine is the wider style with sprocket holes, used for the stencil rolls, and the system would appear to be a modification of the normal production perforating machines then in use. The playing of such heavy piano actions at a consistent speed, surrounded by oil, grease and noisy machinery, is probably far closer to Gershwin's early experiences than the elegant recording studios of Welte or Duo-Art. 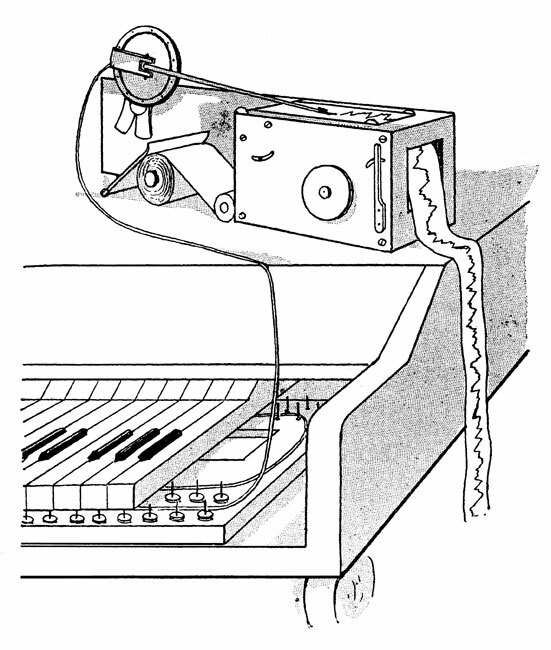 Very little in the way of recording dynamics seems to have occurred before the Welte-Mignon came on to the scene in 1904, but two earlier inventions foreshadowed one of the methods that Welte, and indeed others, were to use, namely the drawing of a seismographic line according to the displacement of piano keys. The first team to achieve this goal was a pair of Frenchmen, Alfred Binet and Jules Courtier, who used the line mainly as a means of studying the minute inflections of tempo in apparently regular piano playing. As any key was played, it squeezed a rubber tube laid underneath both the black and white sections of the keyboard, and the resulting movement of air inflated a diaphragm, connected in turn to a pen recorder. Binet and Courtier's Recording Device, Sorbonne, Paris, France, 1895. 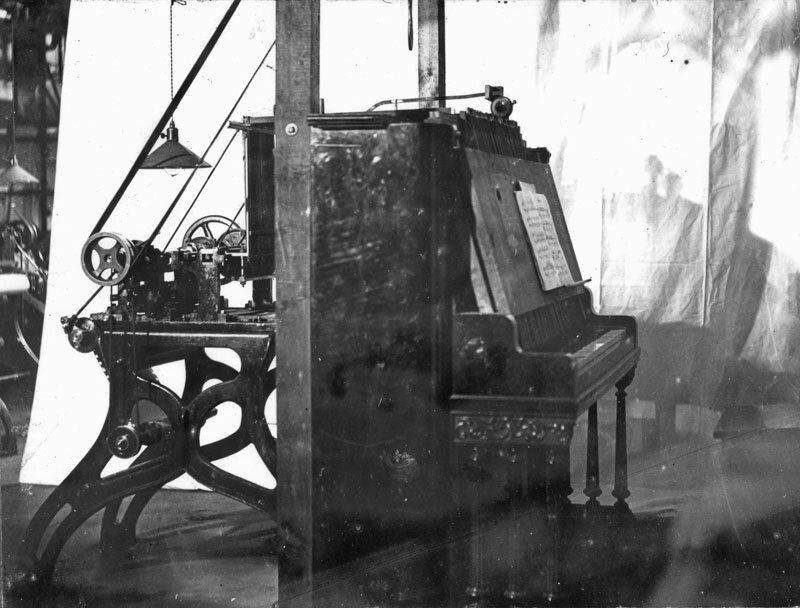 Carl Nyström's Electrical Dynamic Recorder, Karlstad, Sweden, October 1898. Carl Wilhelm Nyström of Karlstad in Sweden seems to have been the first really to have dipped his toe in the water, or, more correctly, his stylus in the wax. Nyström designed a system of dynamic recording for electric pianos by means of electrical resistances and solenoids, for which he received a Swedish patent in October 1898. 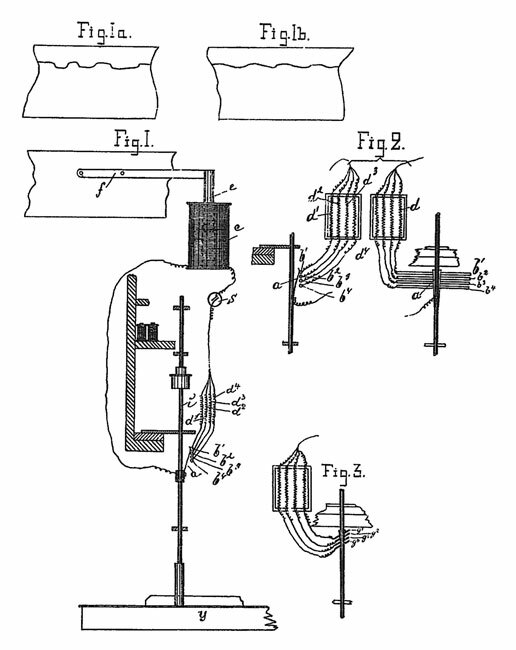 It is not clear that his invention could possibly have worked in an accurate way, since it recorded a groove in a thick, wax-coated paper roll, by moving a stylus sideways in accordance with the depth of key depression, so that only the speed of displacement of the groove indicated a dynamic level, whereas it used a similar stylus to read the groove on playback, apparently taking the actual groove position as the dynamic indicator, rather than the speed of change. Nevertheless, it takes a brave man to be the first to jump, and Nyström's name is deservedly represented in our historical narrative. In any case, he came back with a better idea a few years later, though by then there were other inventors in the field. German Patents - The official website of the German Patent Office, with excellent international search facilities, inclluding a raw text search.